Sometimes, students can learn as much from a simple mayfly as from a textbook. That’s the thinking behind GM GREEN (Global Rivers Environmental Education Network), designed to give students hands-on lessons in science and the environment, inspire employee and community involvement, and encourage more students to take the plunge into science, technology, engineering and mathematics (STEM) careers. GM is now in its 24th year of supporting GREEN, a partnership with the nonprofit organization Earth Force, to help students understand how human activity impacts local watersheds. Last year marked the first time that every GM manufacturing site in the U.S. mentored students in their local communities on water quality and preservation. “Part of the reason I do this is because I was in the fourth grade for the first Earth Day. I helped plant trees, and that experience stayed with me and eventually influenced my career decision,” said Teri Kline, GM’s manager of Environmental, Facility and Materials Policy and a longtime GM GREEN program mentor. Kline, an environmental engineer who joined GM in 1984, leads GM’s Earth Force partnership along with Mary Alice Kurtz of GM’s Global Environmental Compliance and Sustainability group. Earth Force, Kline said, helps ensure that program elements are consistent throughout the U.S. and Canada and makes continuous improvements to keep it interesting and relevant. GM GREEN helps teach students that science is real life and not just something talked about in the classroom. 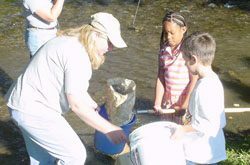 The program works like this: Sponsored by local GM plants, students, teachers and GM employee mentors visit their local bodies of water to conduct water quality monitoring, perform chemical tests, sample for aquatic insects and assess the stream’s physical attributes. For example, analyzing water samples for stream-bottom macroinvertebrates – a crucial link in the aquatic food chain – can help determine water quality. “If there are too few mayflies, the stream may be too dirty to sustain them,” said Kline. That, in turn, can affect fish because they like to eat mayflies. Another red flag might be the presence of sewage worms, which are among the very few invertebrates able to survive in the severely polluted water of a “dead” stream. Before and after water quality monitoring, GM mentors help students interpret data, analyze local issues, apply critical thinking skills and balance opposing viewpoints. They use scientific principles to identify community issues and work to create lasting solutions to improve water quality. Regardless of whether they pursue a science career, the experience motivates students to think twice about what they pour down a drain. “We’ve seen students paint messages on storm sewers that say, ‘Don’t dump oil here,’ or mix science and civics by writing letters to their city councils,” said Kline. The size and scope of each GM GREEN project depends on the school district and level of support at the community level. “We set metrics for the program and try to put in a certain amount of structure while keeping the flexibility that school districts need,” said Kline. To learn more about GM’s environmental accomplishments, view the 2012 Sustainability Report atwww.gmsustainability.com.